I'm not much of a movie reviewer, but sometimes I can't help myself. 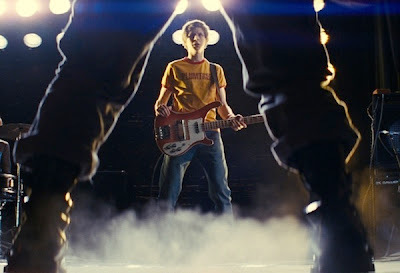 I'm happy to say that Scott Pilgrim vs. the World has provided me with one of those rare 'can't help' moments. Even so, this is not a case of dissecting acting chops, camera angles or plot devices. It's more of a way to get excited about a movie that's undeniably made for my generation. Between the grunge hair, the 8-bit video game references and the angsty directionlessness of its characters, my date and I were clearly enjoying the film more than most of our theater companions. I can't necessarily relate to Michael Cera's Scott Pilgrim personally, but I bet I have a few friends that can. And thinking back on my high school and college days, I can name a few names from those days who were (and possibly still are) of the Pilgrim mold: mooching off friends, spending what little cash they have at the record store, jumping from meaningless relationship to meaningless relationship. At the very least, the record store habit applies to me as well. So does the idea of a girl running through my dreams (correction rollerblading). Unfortunately, I didn't have drawn out video game-style battle sequences with their exs. But that's why Pilgrim's story is the stuff of graphic novels and movie adaptations. How could I not fall in love with the endless strings of sound effects manifested in word form as they floated across the screen in an endless succession of A-A-A-A-A-A-A's and T-H-W-O-O-O-O-O-O-M-P-S? Aside from the early funny pages, I wonder if any generation embraced comic books the way mine did. Leaving the theater I reminisced of days spent aimlessly killing time at comic book stores, hoping the clerk would let me help bag new arrivals and then let me take said arrivals home for free. If I was really lucky, he'd even foot the bill for lunch from Burger King. Those were the years that I also started falling in love with things. Girls, obviously. But also music, clothes, hanging with friends, finding out who I really am. 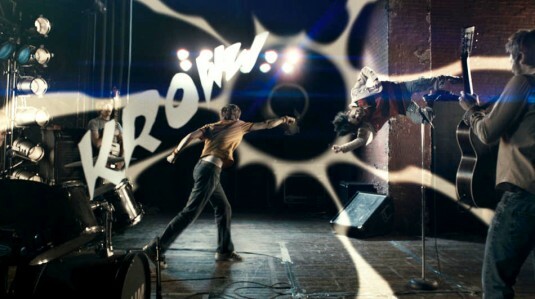 These concepts, while not always well communicated in the movie, are why I enjoyed Scott Pilgrim so much. As Pilgrim battles with ex after ex, from vegan rockers to Asian twins who clearly listen to too much Daft Punk, he finds out what he's really made of. The dynamic between Pilgrim and his muse Ramona Flowers, isn't exactly fleshed out to the fullest. In a sweeping scene, Flowers agrees to a date, tells him it's boring, invites him to her house and then spends the night with him. Next thing you know they're an item and a barrage of battle-ready ruffians fly out of the woodwork, making the rest of the movie an indie rock version of a Dance Dance Revolution version of Mortal Kombat. You still get the point (he likes her, she likes him), and besides, it's the late '80s and early '90s reference points that surface during these battle sequences—my personal favorite being the Smashing Pumpkins tee circa Siamese Dream that conveniently shares Scott Pilgrim's initials—that allowed me to look past the flaws in the characters and in the plot itself. And so it was that I was able to laugh at stupid one liners ('Ciao Knives" said to the young super fan Knives Chau, "Les-B-On is about to be Les-B-Gone" said to Flowers by her female ex), video game sounds and the borderline manic pixie dream girl Ramona Flowers herself, and thoroughly enjoy this ultimately flawed movie. Scott Pilgrim vs. The World - 'Black Sheep' Music Video from Louis S on Vimeo.